Home › History › What was used before Calculators? What was used before Calculators? Before Calculators, what was used? Humans have been counting, calculating, and charting since the beginning of time. At first they used their fingers and then such things as piles of pebbles, bundles of twigs, and simple mechanical devices like the revolutionary abacus. It is hard to imagine a time when we all didn’t have a calculator in our school bag or online, but for the majority of human history, that was the case. So, let’s have a look at how humans got by, for so long, without a calculator. The abacus is a simple frame comprised of rods on which beads are moved to represent various groups of numbers. 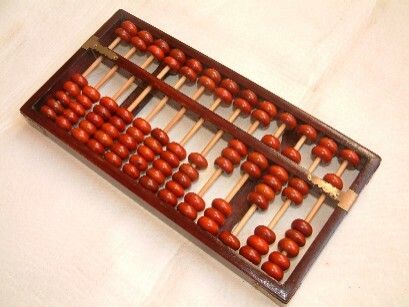 For centuries the abacus was a cutting edge device used by the Chinese, Greeks, and Romans. There is also evidence that the Aztecs in present-day Mexico and Central America used a type of abacus made from kernels of corn strung on pieces of thread. The word abacus, from Latin, means “tablet,” so in one sense the abacus was the earliest version of the tablet computer. Next came the counting board, which was usually made from a slab of wood or stone with lines carved into it. Beads were slid from one position to another across the board to aid in counting and carrying numbers over to higher values. Calculations can, however, be performed much faster using Arabic numbers compared to Roman numerals or beads on an abacus. As the use of Arabic numerals spread in popularity across Europe and the abacus and counting board became rather obsolete. The implementation of the Arabic system in Western Europe is credited to Leonardo of Pisa – who lived where the famous tower of Pisa is located. Also known by the name Fibonacci, he was a mathematician of the early 13th century who wrote a groundbreaking book about numerical calculation called “Liber Abaci”. The book was based upon the Arabic numbering system that his father, a merchant seaman, had learned while traveling to various Middle Eastern cities along Mediterranean Sea. Since shortcuts make it faster and easier to perform calculations, tables are a great resource. Instead of slowly adding up lots of small numbers, for example, we can simply refer to our multiplication tables and do complex arithmetic in our heads. Similarly, as calculations of such things as geometry, algebra, and calculus were done over the years people created tables to use as shortcuts. Those were, in turn, compiled into handy reference charts or books. One of the classic examples is a book titled “CRC Standard Mathematical Tables and Formulae,” which has been around for about 40 years. In the days before calculators, students and engineers would refer to this large book to find formulas, tables, diagrams, integrals, and other data that helped them as they performed calculations by hand. With more than 6,000 entries, and such things as trigonometry tables accurate to the nearest minute, this kind of book was invaluable in the days when calculations had to be done by hand. John Napier of Scotland, who lived in the 1600s, invented logarithms – another kind of shortcut. He also constructed the first slide rule to make it easier to use with those logarithms, and his slide rule was a paradigm-shifting innovation. The slide rule became very popular across Europe and was in widespread use by the 1800s. Amédée Mannheim invented one of the first modern slide rules in 1859, and used it to calculate how to fire artillery to hit a target accurately when he was in the French army. Modern slide rules, like those used throughout much of the 20th century, are about two feet long and two inches wide and have three basic components. The main part of a slide rule resembles a ruler and is marked with scales. Then there is a sliding section that moves along that ruler-style part. The third component is a curser or pointer to set specific points along the scales. These devices were used by students, architects, scientists, engineers, and others who would perform their calculations by using their slide rule while referring to charts and tables. Then they would finish their calculations or draw their graphs using pencil and paper. Yet, as I am sure you can imagine, even this advancement is still far away from the convenience and efficiency of a calculator. Naturally, this process was time consuming and labor intensive. The accuracy of slide rule calculations is subject to human error, too, because if you accidentally read the tiny marks on the scale incorrectly or place the cursor in the wrong place the results will be flawed. Now, while you can argue that a calculator is also prone to this type of human error, but, the odds of incorrectly pressing a key on your calculator’s keypad is obviously less than the chance of someone making an error in this process; Oftentimes a group of five or six students working together as a team might need an entire class session to solve a problem. Today, thanks to automated digital calculators, a student acting alone may solve those same problems with reliably accurate results within a matter of minutes, if not seconds. They can use a basic handheld graphing or scientific calculator or the kind of fast, intuitive, free calculator that is available here at www.meta-calculator.com . ‹ Are TI Graphing Calculators Obsolete?